If you’re on a Low Carb High Fat diet (LCHF), there are a few things you should know about cholesterol and how it is related to this lifestyle. In this guide I plan to cover the topic in very simple terms. It is by no means complete and is intentionally simplified to make it easier to read and understand for the layperson. Before talking about cholesterol, we have to talk about the energy you get from fat when on LCHF. Of course the main reason for food is to supply your body with energy. But how does that energy get to everywhere it needs to go in your body? Like every other living thing, your body is made up of cells. Your heart is made of cells. Your brain is made of cells. So are your fingers, knees and toes. Almost all these cells need energy. And the vast majority of these cells ultimately get their energy from the blood circulating around your body. The most commonly talked about source of energy is carbohydrates (carbs). Your body turns carbs into glucose to put in the bloodstream. From there the glucose can circulate throughout the body, allowing hungry cells to grab some for themselves, and this is done with the help of insulin. 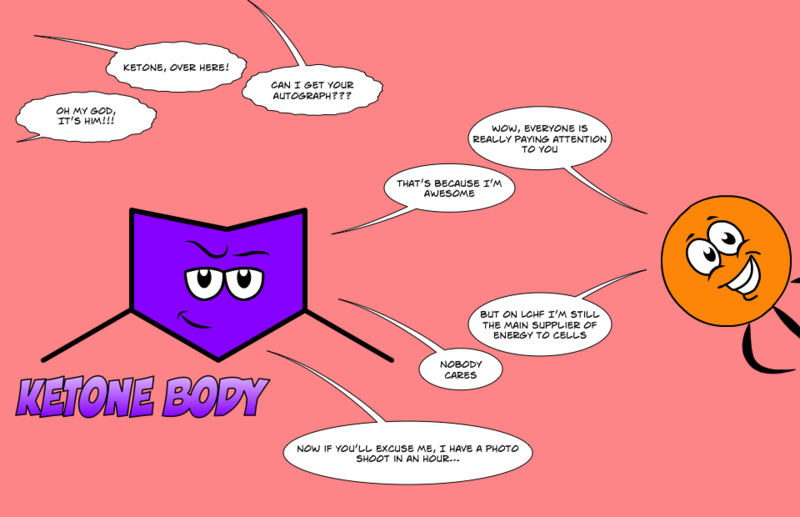 The other major energy source for your cells is fat, and by that I mean fatty acids. 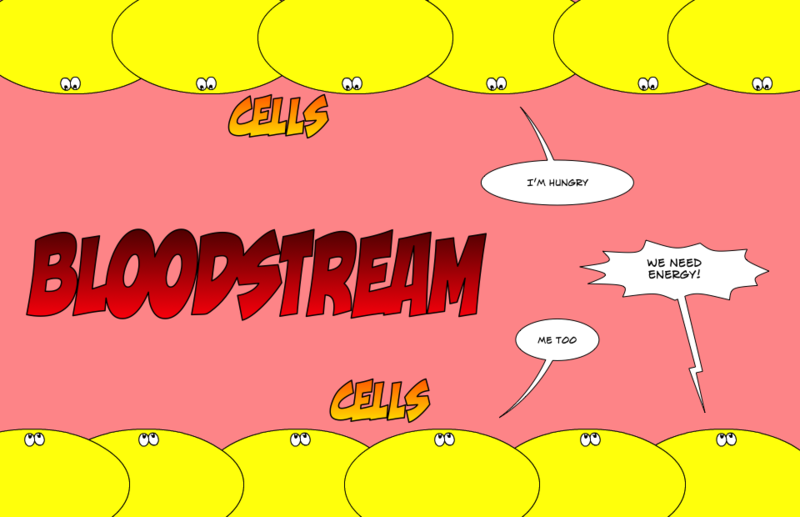 And like glucose, your cells also get their fatty acids from the bloodstream. 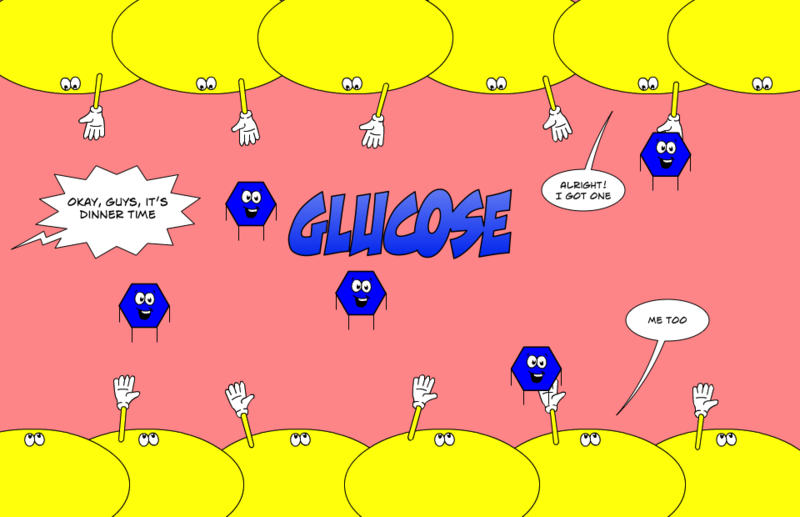 Only there’s an important catch: glucose can swim in the bloodstream easily, but fatty acids cannot. It packages three fatty acids into a combo pack molecule called a “triglyceride”. And it makes a kind of boat for these triglycerides to travel in called a “lipoprotein”. In fact, the kind of lipoprotein that delivers all these fatty acids is known as a very low density lipoprotein — or VLDL. After it delivers its energy, it remodels to a low density lipoprotein — but you probably know it already by its abbreviation, LDL. Odds are you have most likely heard of LDL being used to describe cholesterol on a blood test. “Your LDL is high…” for example. So what gives? Here’s the thing about cholesterol, like its triglyceride cousin, it also doesn’t swim well in the bloodstream. In the medical world, these molecules are commonly referred to as lipids. And lipids are actually repelled by water, so they are commonly called hydrophobic (hydro = water, phobic = repel). So when someone tells you they love to go to the beach but hate the water, mention they must be hydrophobic like cholesterol! Yet what if the body has reason to have cholesterol available in the bloodstream as well? (We’ll get into that more in Part II) And while we’re on the subject, there are a few other things the body wants available to cells that are also hydrophobic, such as fat soluble vitamins (like Vitamin E). So should it make a separate lipoprotein container for each of these molecules? No! It effectively packages all of them into the same boat: the lipoprotein. That’s the genius of the human body. It has a kind of FedEx for all the hydrophobic elements needed by the cells. And most of whatever isn’t used gets recycled by the liver for many other possibilities, such as hormone or bile salt production. The odds are likewise that you’ve heard “triglycerides go down on a low carb diet”. Indeed, blood tests for those going LCHF are almost universally lower in triglycerides. But a measurement of anything in the bloodstream is counting what is traveling around in that moment and not yet in use. For example, Type 2 Diabetes has a common symptom of having very high glucose in the blood. This is because these diabetics are insulin resistant and have trouble getting the glucose out of the blood and into their cells. They may eat the same quantity of food as someone who isn’t diabetic, but glucose in the blood will spike higher and last longer by comparison. If you have reduced your carbs and now get your energy mainly from fat, without question your cells are absorbing more of it from the bloodstream now. So even if you’ve increased the total amount of triglycerides going into the blood due to the diet, it is still brought down by the amount getting taken back out and used by the cells. Another common assumption with LCHF is that you “get the majority of your energy from ketones” since you are in a state of ketosis. It’s certainly true your body makes many more ketone bodies from breaking down fatty acids, which will likewise feed your cells. This is especially important for proper brain function as ketones have special access that lipoproteins do not. Yet while ketones are both produced and used much more on LCHF, they are still a secondary source of energy. 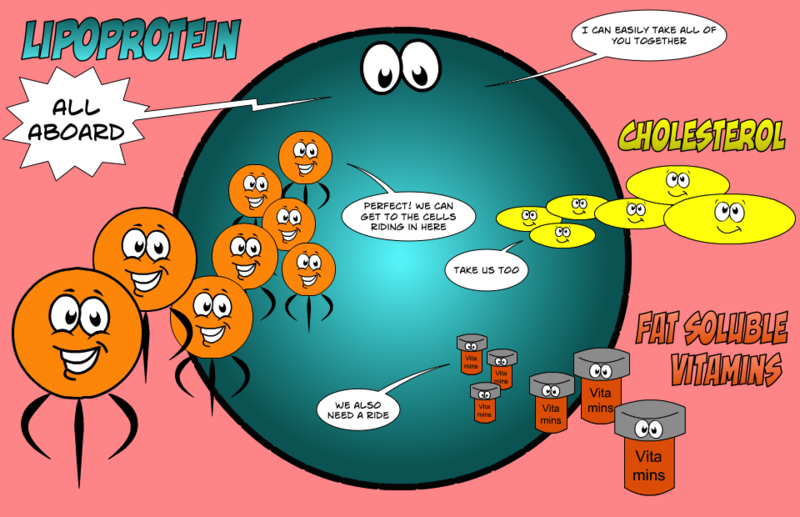 The primary source of energy is still fatty acids brought to cells in LDL particles. Now that you understand your body has need to move around more triglycerides to fuel your cells while getting the majority of your energy from fat, you may have already connected the dots. To get the triglycerides to your cells, your body sends them in very low density lipoproteins (VLDLs), which eventually remodel to low density lipoproteins (LDLs). If you read the above and are struck with fear, I don’t blame you. It has been well drilled into our heads that more cholesterol in the blood = higher risk of cardiovascular disease and stroke. But if you’re early in your research on this topic, let me help you skip ahead with one very crucial point (which I alluded to above). Making something available is not the same as using it. Here’s a simple analogy – life rafts in the water and being used are typically a sign of trouble. Yet all ships sail with them on board. This is a good idea in case of an emergency, of course. But if you were only counting life rafts whether in use or not, then you’d assume a lot of ships entering view was by itself a sign of trouble. Great post Dave, love it! Makes it all so simple to understand. Bravo! Speaking of fun, I have a friend I collaborate with on some games we’ve made (I’m a software developer). He’s suggesting making this into a game for added fun / education. If we get some time (unlikely) in the next few months, we might Game Jam one out. Thank you for the time you put into this excellent and simple summary. Looking forward to the series so I can share it with my less geeky friends in the hope that their eyes can be opened. Will likely also share with my doc who I have brought on board with LC but not HF. Gave him Big Fat Surprise for Christmas and hope it will have the same effect as Why We Get Fat! Yeah — thus far it has already broken session hits relative to my other posts, and it’s barely 24 hours old as I write this! Thanks, Diana — should be coming soon. SO – if high cholesterol on a LC diet is not really a concern why do all of these experiments with regard to cholesterol? The research is key to illuminating differences in how the current perception of cholesterol management is in the literature vs how it is illustrated in my data. I’m extremely interested in the lipid system as a whole, not just with regard to cholesterol, but with the overall management of everything within — especially energy. What are your sources for that? The trig/chol ratio in an LDL particle seems to be something that is highly variable, and IMO, clearly not true for folks with high LDL-C and low trigs – your point about the traffic vs content notwithstanding, at a given point in time, those people’s LDL are carrying mostly cholesterol. Also, mostly trigs in your LDL makes for small dense LDL, which is generally accepted to be a bad thing. One pertinent tidbit you glossed over is that on a high carb diet, once glycogen stores are high, the liver will convert calories not immediately needed into trigs, which of course, is why folks on high carb diets have high trigs. – Chylomicrons and VLDLs are the originating LDL particles (ApoB48 and 100, respectively). Chylomicrons start with 84% trigs, 8% cholesterol. VLDLs start with 50% trigs, 22% cholesterol. As each of these move through the bloodstream they release more and more triglycerides to cells and through CEPT, which is how they become more cholesterol rich (relatively) toward the end. This generally came from many biochem sources when I first began to study this subject, like here. 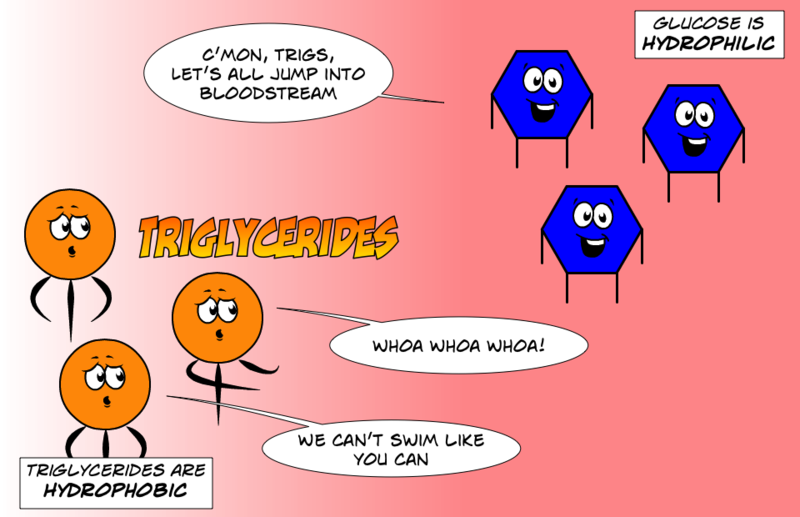 While I think there could be arguments on the exact degree of percentages with variability, I don’t know of anything that argues the proportionality of triglycerides to cholesterol. – Again, a blood test is a snapshot of objects in transit and in their current state. LDL particles change their content over several stages and even their apolipoproteins to some extent. Let’s say you and are pizza delivery drivers. We both start off with 50 pizzas in our cars, and every three hours we return to the kitchen to refill our car back to that number. Throughout our shift you deliver a total of 100 pizzas while I only deliver 10. If someone were to randomly pick a time at some point during the shift to peek into our cars and count how many pizzas we had, I would likely have more than you did, of course. This makes perfect sense from a demand-driven perspective. It also illustrates why you can’t assume from a snapshot that one of us started out with more, nor does it accurately show how much is getting delivered. Great job!! Enjoying your efforts and posts. Thanks for sharing all this. No worries, I’ll be getting around to HDL soon for sure. Great post Dave! I like the different way of looking at it. It all makes complete sense. I’ve had 10 NMR’s myself since starting LCHF in 2011, and my numbers have been high. I would be curious what Dr. Thomas Dayspring had to say, since he says”particle number, end of discussion”. I’m with you though Dave! I’m occasionally pinging Dr. Dayspring, but haven’t gotten word back just yet. Hi Dave, this is all very new to me as I’ve started a LCHF diet last week but just got back the results for my cholesterol tests and they are high. That prompted the question “how am I supposed to reduce fat intake if I’m on a LCHF diet?”. Based on the misinformation surrounding the whole “fat makes you fat” nonsense, I don’t fully trust what the doctor is telling me regarding reducing fat to improve cholesterol numbers. – Why is a high LDL count bad? It sounds like more LDLs would be better as that means more cholesterol can be carried through the bloodstream rather than building up. – Where does the cholesterol go if its not building up as plaque? And to follow up on the last point, the impression I’m getting is that for a diabetic (or close to it) with high cholesterol would be better to just “ignore” the high cholesterol and LDL counts because the fat being burned from the LCHF diet is “worth it” overall, and that eventually it all balances out naturally over time because the body as a whole becomes healthier. I’m not the sharpest bulb in the box as you may have noticed, but I’m trying my best to at least understand at a very fundamental level what is going on when you combine LCHF with a high cholesterol number. >> – Why is a high LDL count bad? It sounds like more LDLs would be better as that means more cholesterol can be carried through the bloodstream rather than building up. >>– Where does the cholesterol go if its not building up as plaque? Most of the cholesterol in LDL particles ultimately end up at (or back to) the liver. I often describe them as “life rafts” on boats or “spare tires” on cars as their behavior is appears more as an emergency backstop instead of a constant usage like triglycerides. Remember, almost every cell membrane is made up of both cholesterol and phospholipids, both are inside LDL particles which can be consumed for spare parts by the cells. But most people assume the more you have circulating in LDL particles, the more you *necessarily* deposit them in your vessel walls as atherosclerosis. I definitely don’t share that opinion as the correlation isn’t very strong at all (given the hypothesis, it should be a very solid line with a near logarithmic curve). You’re getting the most important part right there. To complete the thought, more LDL particles (LDL-P) means more *trafficking* of cholesterol (just has having more ships circling the bay means more liferafts technically circling with them). Also, I haven’t seen you cover oxidized cholesterol, but maybe I missed it. I would strongly recommend Chris Masterjohn’s writing on this topic if you haven’t seen it. I am also a hyper-responder so I have been following this topic for a number of years. While it seems fairly clear that many people can have what mainstream “medicine” would consider elevated cholesterol and still be perfectly healthy, there are also some other issues which can also creep in which are likely worth addressing. Specifically, Dr. Gundry has said that in his experience he often sees people with a high level of oxidized LDL which resolves if they switch to A2 casein instead of A1 casein and reduce cheese consumption. It seems that while LDL is far from the most important issue, it is still worth considering if related factors like problem foods are creating an unnecessary elevation. Sorry for the late reply, this one somehow flew under my Comments Radar. – Yes, I’m familiar with and have read much of Chris Masterjohn’s work (and highly recommend it). But I haven’t done much specific oxLDL testing because I still feel the technology is in its infancy. Moreover, there’s almost no test I will take unless I can take it several times over — as you can see by my blog. There are several reasons for this, but the biggest is to help disqualify tests that appear erratic and error-prone given how they do/don’t match up with other markers appropriately. If you’ve been closely following this subject, I’m sure you understand why I’m less willing to spend the $$$$ on emerging tests, particularly when the initial studies on the tests involve researchers with stakes in the patents/IP. – I think I came across the A1 v A2 casein discussion before but it was early on in my research before I understood the lipid system as I do now. It is probably worth a revisit – thanks! – “It seems that while LDL is far from the most important issue, it is still worth considering if related factors like problem foods are creating an unnecessary elevation.” — I couldn’t agree more. BUT, my research is exposing why the use of a single LDL test as a marker is so problematic given how dynamic it is with regard to food just consumed in the previous 3-5 days. So much of where this leads me is to respecting the technology that gets me the data, but being much more skeptical of studies that use it outside this context (which is all of them, for now). Thank you so much for your continued pursuit of this topic. I am a physical therapist and have been relentless with my self education regarding nutrition over the past 2 years. I am scheduled to speak with a cardiothoracic surgeon who is very into nutrition and primary prevention as well. His interest is how to best lower LDL without a statin. I’m not sure how he will respond when I bring up the idea that LDLc is a terrible biomarker per Dr.Dayspring and per other articles, data and experience. What I would like is to use your examples to tell the story and also to pick your brain a bit more regarding specific nuances to make sure I have my bases covered. If you are able to could we communicate through email? I will leave my email below and hope to hear from you. Thanks again. Per your comment and my response on Twitter, I did reach out to you through the email you provided. Hi Ray and Dave–I’m a speech therapist at a major hospital in DC and am developing nutritional advice for stroke patients along with help from clinical dietitians. Unfortunately they are very usda guidelines focused and tend to recommend way more grains and carbs than I do and they definitely steer patients away from saturated fats. Any luck developing good advice for lowering patients risk of cardiovascular disease? Feel free to email me or connect me to Ray. Thanks. I see your previous comments re: Dr Attia so no need to respond!! just found your site today and can’t stop reading. I love your analytical engineering aproach to it. When are you going to write about HDL? I am very interested to know the mechanism of my HDL increasing on ketogenic diet to the point that is much higher than my LDL. I have been on low carb for about 4 years with the last year being mostly keto. My Total chol in 2013 was 200, HDL was 94, LDL 100 and Trigs 0.38. My last test in Sept. 2016 Total chol. 238, HDL 125, LDL 103, Trigs 0.5. What does it mean when HDL is higher than LDL and is that ever a concern? I do not see this ratio very often. Oh just noticed I converted cholesterol numbers from mm/l to mg/dl but did not convert triglycerides. They went from 34 to 44. I can’t say for sure that unusually high HDL such as yours is problematic, but I’m very doubtful. In your shoes I’d want to get an NMR to determine both my HDL-C *and* HDL-P. Not to set off your alarms, but its a theoretical possibility that you have normal or low HDL-P that are very engorged with cholesterol, which I’ve seen before in one other person’s lab. Might need another category: My cholesterol and triglycerides have always been high, but I remained skeptical of taking statins. From 2001 to 2017 (N=22), my TC averaged 260; TG avg 356; HDL avg 37; LDL avg 169; glucose 94 (all after 12-hr fast, and on HCLF diet). In 2010, my blood after a 4-day water-only fast showed TC=312; TG=271; HDL=34; LDL=224; and glucose=62. I assumed my TG dropped because my glucose fell, but I was surprised at the jump in my TC. I went keto in 2017, and my June bloodwork (non-fasting; LCHF) showed a huge spike in TC to 397; a spike in TG to 740; a drop in HDL to 29; LDL not calculated; and glucose at 92. The rise in TC fits the hyper-responder profile, but WHY would my triglycerides skyrocket (especially with a modest non-fasting glucose at 92), and why would my HDL drop? – Your bloodwork is very unusual. Obviously, it suggests hypertriglyceridemia. But I haven’t seen a series at your level that also had pre- and post-keto. There appears to be a lack of uptake for your TG at the cell level making me wonder if it is something genetic with LDL lipase or similar mechanism at that phase. It is certainly odd to see TG rise and HDL stay the same or fall after going LCHF. – I most definitely DO NOT advise eating near a test. I always strongly recommend having at least a 12 hours fast given the clearance of Chylomicrons isn’t strongly determined in the hours after a meal — but it IS fairly assured to be cleared in the 12 hour time span. Because of this, I’d want to retest your June 2017 bloodwork with a 12-14 hour fast to see if you get the same results. As always, be sure to eat to your “general” range in the three days before as well, given the Inversion Pattern. – If it’s okay with you, I may pass your numbers by a few of my doc friends to get their opinions. I’m curious how many have seen anything similar. Hey Dave, possibly similar to the above. 5 months into a carnivore diet (fatty steak, bacon, eggs, water). Triglycerides are moving a bit, but still stubbornly high. Have a good doctor on the journey so no panic there. TC 9.1 (steady over 2 months and 3 tests) /HDL 1.3 (up from 1)/ LDL 6.7 (down from 6.9)/ TG 2.3 (down from 2.9). 6’3″ and weighed 102kg’s, now down to 86kg’s. I understand the protocol of more TC and TG being dumped into the bloodstream and that it will (should) settle down as my weight settles out. Doctor doesn’t believe I have any issues with insulin or hypercholersterolemia (TC was 5.1 about 3 years ago). Using your calculator I fall into high risk on both measures. For what it’s worth….I feel fantastic at 45. Can i send my blood work through to you? I *do not* expect to see high TGs on LCHF diet and would want anyone with high levels to try to find why. Certainly eating high fat and losing weight will result in higher TG going into the bloodstream, *however*, the USAGE of this TG should exceed that and bring it much lower in total. This is why low carb high fat athletes have the lowest TG levels of anyone on any diet. I found a new doctor familiar with low carb and we’ve been working closely to track changes etc (4 blood tests this year). Briefly….did Jan and Feb as keto with all of the associated fat bombs and heavy cream etc (no keto supplement stuff, all real food). Carbs are definitely zero. Have been carnivore since March (bacon, eggs, steak, bone broth, water). The one that jumps out now is your point about coffee….bugger! I have about 5-6 espresso each day. Next blood test is in 6 weeks so will have my last coffee today and see what happens. If it’s not coffee then we are also focusing on insulin and liver….don’t know what else could be the issue. Good ol’ coffee — it seriously has come up at least five times in the last two days especially. It’s really becoming a common denominator with low carbers and high triglycerides. Dr. Michael Eades linked to your website, so I thought I would check it out. This ‘beginner’s guide’ is amazing and really informative. The cholesterol thing is something I have always been quite confused about (and I did wonder why long-term keto’s had “high” blood pressure after many years). Although I am curious about your comment on long term keto bringing “high” blood pressure. I find it is the opposite. Your work is awesome! I use your data to disrupt conventional medicine every chance I get. That said, what is your generic advice for FH patients? Actually, almost everyone who is a Keto/LCHF hyper-responder has LDL levels consistent with one who is FH, but only a few have been *genetically* FH. Generally, if your cholesterol was “normal” or low before starting the diet, then changed to very high levels soon after, then it is unlikely to be genetic FH as you’d have likely had high cholesterol your entire life. This article is very good in helping me understanding cholesterol. I started a LCHF way of eating about 5 weeks ago. I lost some weight but didn’t have much to lose. I went to my yearly appointment and they checked my labs. My TC was 290 and my LDL was 210. I am 37 years old, 5’4″ and weigh 117. I don’t know if that information matters. From my understanding, these numbers don’t mean anything and I would have to have my particles checked to see if there is a real issue. thanks in advance for any information. What is your HDL, Triglycerides? Also, are you lean and/or athletic? Hi Dave thanks for the invaluable insight you gave me about cholesterol. After 4 months of keto I had my blood work done I realized my cholesterol was high.My weight is 70 kg and I’m 178 cm high.I’m moderately active . I have heard if LDL cholesterol is over 130 it’s not healthy and the small dence particles are high. I don’t know how they came up with this number.In my country NMR test doesn’t exist.I really love this diet but there are alot of confusion. How can i get more information about my condition? Thanks you so much. After now seeing hundreds of labs, I can say the pattern is generally true that if you have high HDL and low TGs, you typically don’t have many small dense LDLp. If you’re concerned about lowering your LDL, you will likely have success replacing more of the dietary fats with carbs. Been on a LCHF diet for the last 2.5months (was in keto for a bit). Lost ~20lbs during that time. Went in for my blood test last week and was surprised to find that my cholesterol went up. Good news is that A1C dropped. I read through your simple guide to cholesterol and was trying to understand the reasons for the possible increase. In addition, what other tests should I do to get a more accurate picture of the risks? That’s a pretty unusual profile for low carb. I’d like you to consider tracking your food closely moving forward. When I’ve seen HDL low and TG high *despite* going low carb, I’ve found there have been “leaks” in the diet. This has been predominantly the case with my family and friends when working with them directly. It’s possible you have other forms of carbs you’re not catching as easily (in my f/f case, it was usually condiments, sauces, drinks, and often one or two favorites they assumed were fine and turned out not to be). This was especially the case with my dad. When his TG went up and HDL went down following a better period, we went closely through his diet and found two key leaks — an asian dish he thought was “light cheating” and heavy whipping cream he didn’t know had 1g carb/5ml (different brand than he normally gets, but he wasn’t watching the label). Trying to understand the numbers and conversions and just looking for some clarity of direction. If you have the time please can you check my recent blood work. I am a 54 yo female , train 3-5 times weekly weights / cardio 62 kg and 154cm. Thinking low trigs , CRP and fasting glucose good and HBAiC in range probably a good predictor. however high LDD and total cholesterol still a red flag but with low trigs my be a indicatory of minimal risk of small dense LDL particles ? Think a cac scan and lipid subtraction analysis will give greater clarity? Start with the Simple Guide. Very well done. I am an internist, a lipidologist, and a hypertension specialist and I preach ketosis for many patients. I would make one constructive comment……a “typical” LDL particle is 4 parts cholesterol to 1 part triglyceride, so most of the baggage on the ships isn’t triglyceride (unless you’re dealing with an insulin resistant patient with high VLDL). VLDL (recipe: combine a bunch of triglyceride with a little cholesterol and wrap it with a lipoprotein called ApoB which you might refer to as the hull of the boat) has a triglyceride to cholesterol ratio of 5:1……..and that may be what you’re referring to. Since you’re a lipidologist, I can speak geek with you! LDL particles picked up from a fasted cholesterol test are mostly VLDL-originating. Which is to say, they start with many more TG than cholesterol but quickly drop them off in the initial stage while they have their apoCII for delivery. So in a sense, distributing energy is their biggest job from both a payload and activity perspective (just not a time-based one). Imagine someone who delivers meals all day Monday and Tuesday, and is then a volunteer fireman the rest of the week, but rarely does more than being on call. Their material impact is primarily on those first two days… unless of course, there’s a lot of fires going on! This is why you’re exactly right that having high TG matters quite a bit — it is common in a dysregulated state (typical of hyperinsulinemia/T2D) where the energy isn’t dropped off given the lack of takers now, thus leading to unremodeled VLDLs having much longer residence time. But likewise, it matters in the reverse! In a LCHF diet, if there’s a lot of LDL-C, yet low TG, this is very suggestive of proper energy distribution if it is concordant with LDL-P. More “boats” to carry more energy, and sure enough, the energy is depleted (remodeling the boats to LDLs that are TG poor). Thus, it seems pretty clear the upregulation of VLDLs is met with a likewise usage of the energy they bring, which makes perfect sense in a lower glucose, higher fat use environment. This energy distribution model is the core of my research and how I’ve been able to manipulate my own cholesterol numbers substantially (see presentations I’ve given linked throughout the site, such as the one I’ve given at Breckinridge: https://www.youtube.com/watch?v=jZu52duIqno). Yes, typically TG goes down on LCHF/Keto. But it’s hard to judge whether what you’re talking about is good or bad because TG itself is very “noisy” anyway and you didn’t post your exact numbers. For instance, an increase of 5 or 10 mg/dl is probably normal variance. If it jumped by 100, that would be much different. Hey Dave, had a question about my history with lipid testing. Can you please email me so we can discuss? TIA! This is awesome for dumb guys like myself. Thanks! Overall, my research suggests that this is primarily impacted by energy distribution. Check out the first links in the START HERE section of the home page for more info. Certainly Reverse Cholesterol Transport is relevant to total LDL, but I’m skeptical it has much (if any) regulator feedback on total LDLp trafficking. As for your friend, if his high cholesterol is truly genetic (As in Familial Hypercholesterolemia) then diet actually shouldn’t affect it to the point of “normalizing” it. The high cholesterol in that case would be due to some differences in how his system works as opposed to metabolic health issues or fat metabolism that we typically see. However, there may be some things for him to consider. Number one is – beyond just LDL or total cholesterol – what does his over all lipid panel look like? It can be a great window into metabolic health if you take all the information together. For example, how high are his triglycerides? What is his HDL level? What about Remnant Cholesterol? Dietary changes would likely be able to influence these factors by influencing over all health. There’s some recent info from Virta on this in which patients on a ketogenic diet had pretty much all risk markers lowered into a lower risk range… granted they were diabetic, but may be applicable to the wider population with poor markers. The other thing to note is that there is a study for those with FH in which the major difference between those who had had a Myocardial Infarction and those who hadn’t wasn’t LDL level (they were about the same) but rather the level of insulin, and insulin resistance between the two groups (high IR/insulin = MI) as well as some other markers like high triglycerides in the MI group. I’m so confused about the Feldman protocol are you saying that if I did a ten day fast before my blood draw that my ldl number would theoretically be higher?I am leaner than I have been in 45 years but my ldl was 278,hdl70,trigs 65 370 total I am willing to pay to get retested…maybe You can use me in your study….How worrisome are my numbers ? Your numbers seem right in line with a Lean Mass Hyper-responder ( http://cholesterolcode.com/are-you-a-lean-mass-hyper-responder/ ) Are you lean and/or athletic? Lastly, I ran your risk profile through our report tool. But interestingly, your LDL calc from the report would’ve been 287, not the 278 you wrote above. If that were the case, you’d have even lower Remnant Cholesterol and even lower overall risk. I don’t understand the process of how plague is building up in the arteries. Could you please explain this process. This is really an important question for me. Thank you for all your explanations about the cholesterol. But I can’t find how the process of plague is building up….. I actually wrote an article on this exact topic for the site, you can find it here. Thanks for a very interesting article. Great job 🙂 But I don’t really understand how to avoid plague is building up. I am eating LCHF because my cholesterol readings is better. Is it possible for you to in an easy way tell me how to avoid plague? Is LCHF a method for avoiding plague? Is it the carbs who a responsible for the plague building up or what.. 🙂 ? While I can’t say for sure what exactly causes it (or how to prevent it) especially as I’m not a doctor, I can say that my leading theory is that damage to the arteries seems to be the starting point and aggravating point for progressive plaque accumulation. This can come in different forms – exposure to pollutants, poor diet (possibly highly refined carbohydrates, and seed oil consumption), lack of sleep or poor sleep quality, and chronic stress (all of these things also cause increased risk of heart troubles). All of those things also appear to increase insulin resistance, and insulin resistance is very much related with cardiovascular disease risk from what I’ve seen so far. So a few things: since we don’t know for sure, if you’re worried about it it may be best to do what you think is right (like LCHF, proper sleep, etc), and then just make sure to check in and make sure everything looks okay. How’s your HDL, triglycerides, fasting insulin, hs-CRP, etc. Possibly getting CIMTs at a frequency you’re comfortable with to check for arterial thickening, and even a measure of the actual disease a calcium score (CAC) to check progression every 3-5 years or so. Sorry I can’t give you a straight answer, but I don’t think anyone knows for sure – all we can do is look for the signs and do our best. Personally for me that’s a LCHF diet, with no seed oils, no refined carbohydrates, proper sleep, etc. Thanks for the article… Is it possible for you to tell me in an easy way what I can do to avoid plague building up? Is LCHF a way to go? Is it the carbs who causes plaque? Your article is well put together. Even a mainstream doctor or nutritionist can follow along (I jest). As you mentioned in an earlier comment, one would think that a higher level of LDL would increase the amount of plaque in arteries, but there was no linear data to support this. Am I understanding that correctly? It seems so counter intuitive. Can you provide me with the research you used to arrive at this conclusion. Is there any research showing a correlation with atherosclerosis and inflammation? Starting grad school for nutrition and I find this concept extremely compelling. Good luck with your future research. I’m looking forward to seeing what you uncover. Love this research. My question is, other than doing the experiments to convince ourselves that you are right (which I already believe), is there any value in doing NMR testing? I haven’t done it in a while and have purchased a test, but not sure what I should do leading up to the test. Just eat like normally, but without any fasting? To get an idea where I am most of the time with my typical diet? Sure – if you just want to use it as a check in for how your current diet is doing you, just go ahead and eat as much and when you normally do, then water fast for 12-14 hours (no coffee, no caffeine, just water). That should give you a pretty good idea. If I had to get basic of basics it would be a lipid panel, NMR, insulin, and hs-CRP just to check in with where I’m at. Hey Dave, I have found your research informative and quite frankly a bit reassuring. I suffered a widowmaker when I was 47, that has been two years ago. I had 99%, 60%, and 55% blockage in my main arteries of the heart, which now I have 3 stents in place. I recently went off my statins, because of the results it had on my memory, talk about brain fog. I have adapted a low carb lifestyle, but still tend to freak out in regards to my LDL. Hi Sharon– Of course, as always, I emphasize I’m not a doctor or medical professional. Moreover, I don’t do a lot of research in secondary prevention, so I don’t yet have even a speculative opinion on it just yet. Dave, first your discussion on ketones in part 1 is WAY to brief to be well understood. For example, where are the ketones made? Do they ride in the VLDL boat? Also, you make this statement: “The primary source of energy is still fatty acids brought to cells in LDL particles.” Is VLDL considered a ‘particle’??? Define a particle please.